Released just today, TrialDirector for iPad is a free app, available now at the iTunes store. Once you’ve started your download, come on back and read the rest of my review. I’ll assume you don’t need to spend a lot of time comparison-shopping before making this decision – even if you already own another trial presentation app. Did I mention that it is free? With the earliest entries in this category (TrialPad and Evidence) being released back in December of 2010, TrialDirector for iPad is certainly a little late to the table -- but then, they’ve brought the dessert (since all of their competitors offer their apps at a price). Other apps available for trial presentation I’ve reviewed include TrialPad (currently at version 2.2.5, release date 5/29/12, version 3.0 just submitted to Apple for approval and release), ExhibitView (currently at version 3.1, release date 8/20/12), Exhibit A (currently at version 2.0, release date 9/18/12), and Evidence (recently discontinued). Each has its own strengths and weaknesses (follow links to in-depth reviews). TrialDirector for iPad is a simple, easy to use evidence management and presentation tool designed specifically for use with the iPad. your case through a Dropbox™ or iTunes® account and interact with your evidence using the annotation and presentation tools. For a more professional and feature-rich experience, users can prepare exhibits in TrialDirector 6 (such as editing closed-caption video clips, pre-treating with annotations or creating workbooks) and export to TrialDirector for iPad for presentation. * Free telephone access to inData’s top-rated technical support team. One of the best features of TrialDirector for iPad is its integration with the full PC software version of TrialDirector. TrialDirector now has a feature which allows you to create a Workbook to export your case exhibits and clips to TrialDirector for iPad. It will even automatically convert your depo clips to MPEG-4 format for iPad video compatibility, and will load your all of your exhibits into one easy file, which may then be imported via Dropbox to your iPad. You could also export as a standard Workbook for compatibility with other apps, without the “automatic” database creation feature. If you import a case from a TrialDirector Workbook, and then add individual exhibits, you can create multiple copies of an exhibit with the same file name, so you should be careful with your organization. In this case, sorting is chronological in the order in which data is imported, and then alpha-numeric. If you’re just importing exhibits manually, they will be over-written with the latest copy. If you don’t already have Dropbox, you should get it now, since it is the most popular app for moving data between your computer and iPad. Since this article is about free things, you can get 2 GB free, and you may use this link for an extra 500 MB of space. 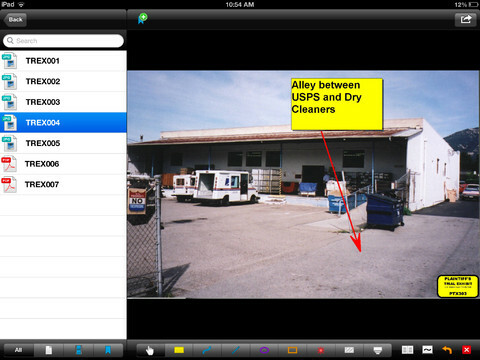 Exhibit organization and annotation features are typical, and what you’d expect to see in a trial presentation app. If you’re already familiar with another trial presentation app, this will look similar. If not, you’ll be up to speed in short order. It is very simple and basic, for the most part. Although you can remove exhibits from an existing case, the process is not yet documented. In order to do so, simply swipe (left or right) an item in the exhibit list to bring up the “Delete” button, in the same manner as you would with an email message. When you connect your iPad to an external cable, TrialDirector for iPad automatically sends a signal, displaying an icon on the presentation screen. Wireless connections via Apple TV are also supported. You may show an exhibit, or an exhibit plus the exhibit list. You can display two exhibits side-by-side, and may use multiple callouts. There is also a whiteboard feature. Overall, TrialDirector for iPad is a decent app for trial presentation. Although the app works well, and is priced right, there are a few areas ripe for improvement. For instance, the highlighter tool gives that semi-opaque (e.g., PowerPoint) yellow overlay, which actually makes the text harder to read. The callout zoom tool doesn’t expand beyond the width of the document. If you’d like to zoom in on a full-width paragraph, the level of magnification will be minimal. Other than that, everything seems to work well, and given the cost factor, and especially if you already use the full-featured computer software version of TrialDirector, might as well get it. I mentioned it, and was told it was on the list for future updates. It didn't make it on the first round, released 11/6/2012. * Re-located laser pointer to position above and left of stylus / pointer finger. * Improved ability to place annotation within callout projection which resides outside of document border. * Improved ability to move callout tool off-screen. * Improved image processing to resize initial image on load to reduce memory footprint. * Improved app stability when displaying callouts on external screen. * Limited simultaneous callouts to 3 per image when using external display. Both of these apps look terrible on the iPad mini. Ted, have you tested either there? The screen is just too small I think. Thanks for sharing your insight! I haven't tried, since I don't own the mini. I'm more about functionality than anything else, which explains why I use a 17" laptop, 22" monitor, and couldn't see trying to use something closer to the size of my phone to work on. Although some say they like it better than the full-size iPad, its smaller size pushes it back more toward a viewing device (consumption), rather than something you can actually do work on (production). I agree. It looks like the iPad min is cannibalizing sales of the larger iPad. So, your view is the right one, the iPad is primarily a consumption tool and not a tool for doing real work on. Very nice evidence management and presentation tool... thanks for letting us know about it, Ted.